I used it on a couple of rainy day hikes/runs and a backpacking trip when I was rained and hailed on in 30-degree temps, which is about the worst weather you can find in my neck of the woods. I was pretty surprised at the material in the initial unboxing, which didn’t have that high-end garbage bag feel I’ve come to expect from backpacking rain jackets. Instead it was thicker with a kind of velvety texture and was, as its name suggests, stretchy. It’s also more slim-fitting than the average rain shell. The small I got didn’t fit too snug or tight, but it would be a tight fit with my all-hands-on-deck-it’s-freezing backpacking layers underneath (a long sleeve, a fleece, and a puffy). It has draw cords in the hood and around the hem, as well as Velcro wrist cuffs. 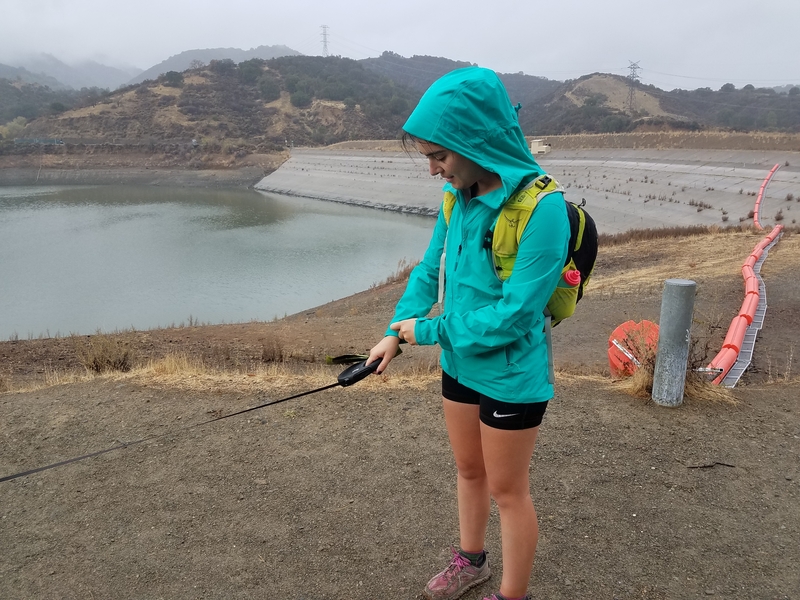 I thought its thicker material would mean it would weigh a little more than your average lightweight hiking rain jacket, but a quick survey of a variety of popular models on REI’s website revealed its 9.3 ounces were in the middle of the pack, weight-wise. A rain jacket’s most important job is to keep you dry and it does that job well. Water doesn’t sneak through anywhere. 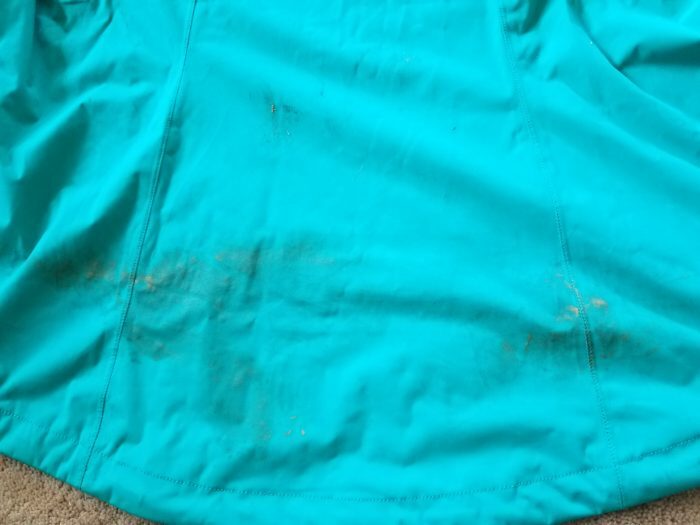 My old jacket would let water in through the zippered pockets, so I stuck some tissues in the (also zippered) pockets in my first use and they came through unscathed. I usually wear a baseball hat under my hood for added protection in the rain, but the hood seemed to work pretty well on its own, although I did return to the hat once I felt I’d given the hood an adequate shot at working solo. 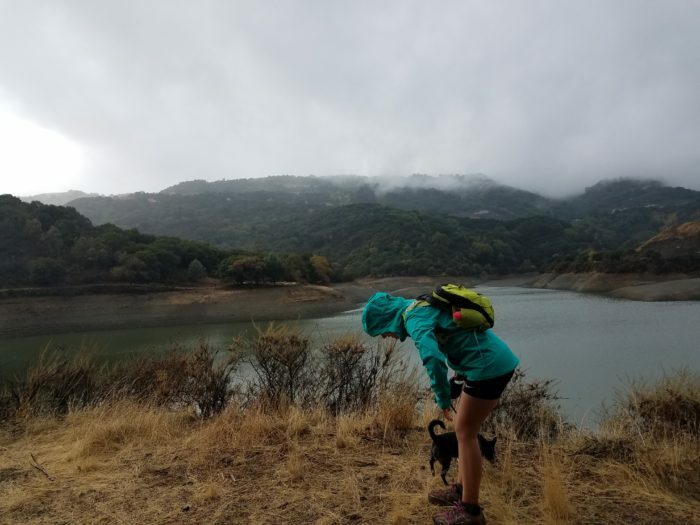 Truthfully, I don’t think any rain jacket can be fully wind and waterproof but not become a sweat box when hiking uphill. I was really comfortable in it hiking uphill in 30-degree temps, but during my other day hikes when temps were warmer hiking uphill got a little toasty. I did run in it twice and didn’t pass out from water loss. It does have pit zips (which is a mandatory feature on hiking rain jackets, in my mind) and they do improve the situation. I would say this was both the most fashionable and comfortable rain jacket I’ve ever worn backpacking. However, it has a couple of backpacking specific functionality drawbacks for me. Because it fits a little snugger, the pockets sit higher, exactly where your pack’s hip belt would sit, making it uncomfortable to carry things in your pocket you want to keep accessible but dry like snacks or your phone or other snacks. Also, something about the material makes dirt and mud stick to the jacket and stay there even after the jacket is dry, which probably isn’t something most backpackers would get too worked up about. The jacket is machine washable, but a lot of thru-hikers (myself included) wear their rain jacket while washing all their other clothes in town, which would make for a very dirty-looking jacket at the end of a really long hike. Not pictured: Freddy’s rain jacket even though he looks really cute in it. The jacket is really comfortable and works well, but has some specific to backpacking drawbacks that may or may not be issues to some hikers. I personally will use it again for day hiking and running (it’s a phenomenal running rain jacket) but will probably be less likely to use it for backpacking.